We have recently executed, on behalf of one of Redington’s largest pension fund clients, a volatility controlled equity benchmark with a put option giving protection on the downside beyond -10%, over one year. the pricing obtained from the banks invovled in the RFP was incredibly competitive with the final executed cost of the option being around 0.9%p.a., considerably less than indicated below. This is equivalent to an implied volatility of around 11%, compared to a 10% volatility target of the underlying index. Barrie & Hibbert / Moody’s analytics have produced an excellent paper which shows that applying a volatility controlled equity benchmark reduces the skew in option pricing under all equity price models, including those with jumps. Imagine you hold a passively managed portfolio of equities, tracking a conventional benchmark such as the FTSE 100 or S&P 500. If you become worried about large falls in the value of this portfolio, then clearly one response is simply to sell some or all of it, but then you also miss out on potential future upside. Another response often considered is to buy short or medium term protection on the portfolio, in the form of put options. The problem with this is that firstly the cost of such protection often look optically “expensive”, ie the cost of such protection will often appear to eat up a large part of expected future upside anyway. Secondly, the cost of such protection is hugely variable through time and often at its most expensive when there is most interest in using it (after a large market fall). The reason such protection is perceived to be so expensive lies in the motivation behind the pricing. The black line in the chart below shows the realised volatility that we would have experienced from a passive holding in the FTSE 100 over the last 26 years. Clearly its hugely variable through time with several well-known spikes to levels several times the average. When we approach a provider to try and buy protection against falls in this index, its these big spikes in volatility that will worry the trader. He knows that although they might be rare, these spikes are what will cause the protection to pay out, and that in these situations, because of the hugely elevated level of volatility, the payout could be massive. This worry about volatility spikes will manifest itself in a “skew” in the pricing of the downside protection. 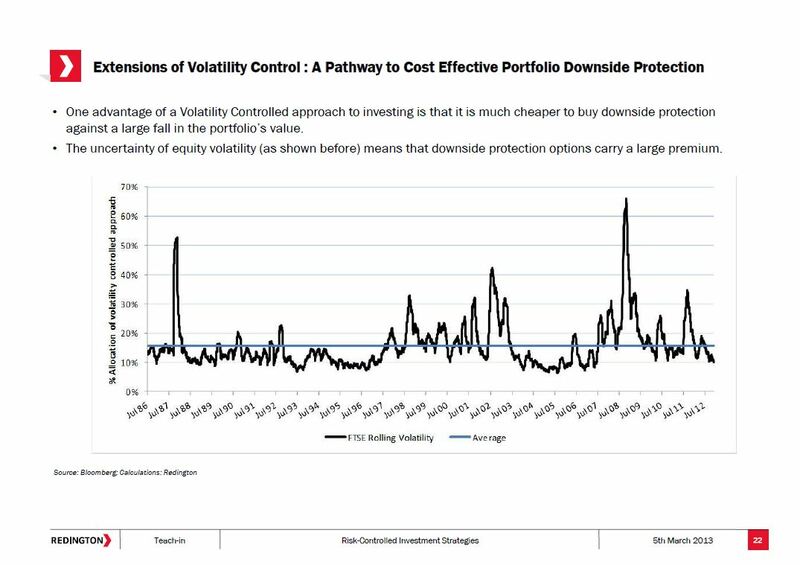 In other words, the implied volatility of options that pay out under large falls in a portfolio’s value appears much higher than the average level of volatility in the market, and also higher than that implied by options that pay out under less extreme events. How can risk control help ? 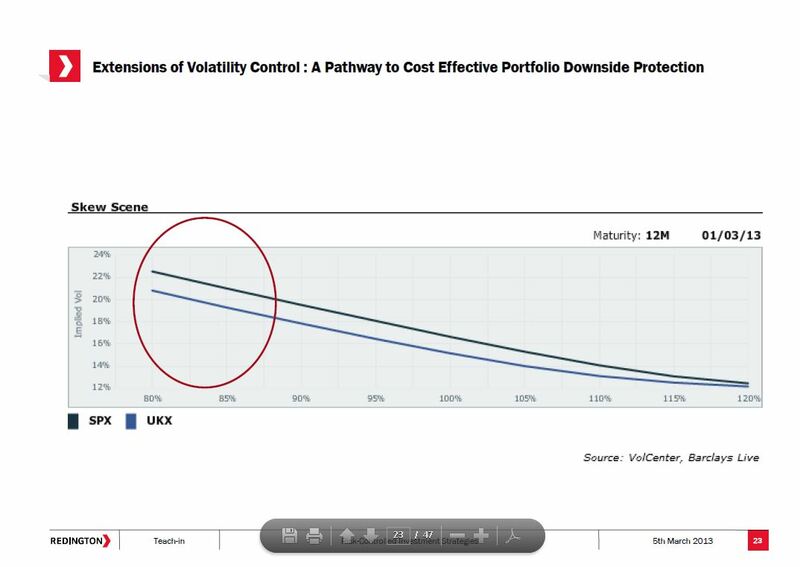 An investment strategy that dynamically manages exposures in response to changing risk -or volatility- levels as described here and here will have substantially reduced its exposure as volatility is spiking, hence things are much less likely to get “out of control” on the downside compared to the passive portfolio that holds onto the exposures no matter what. 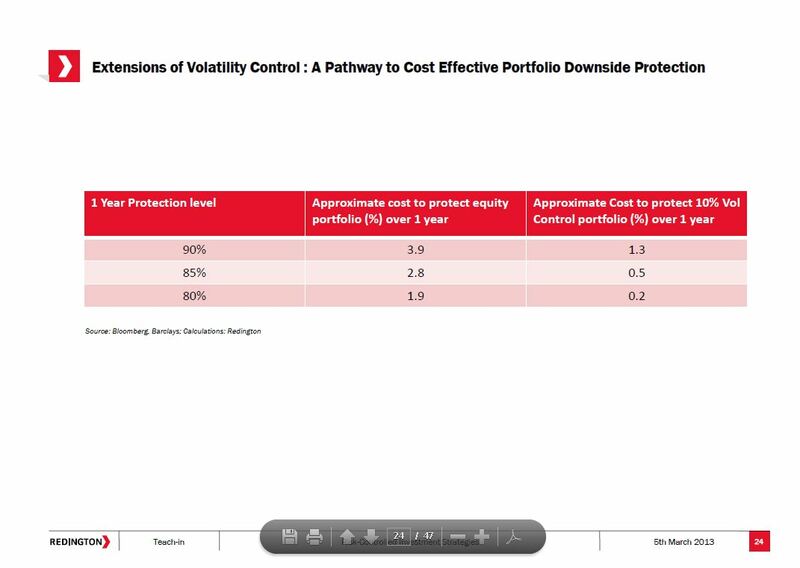 This means that when we go to a provider to ask for a price for downside protection, the provider can price that option much more confidently at an implied volatility much closer to the target volatility of the actual portfolio. In terms of the actual premium for this protection, as shown below this can result in an option premium 80% less than that for the passively held portfolio. Obviously, there’s a reason why the premium is less – it’s because the protection is much less likely to pay out and if it does, the payout will be smaller. That’s because we’ve already employed quite an effective risk control mechanism in the portfolio, which means big losses are far less likely. If downside protection is important, and to some investors it will be, it seems logical to have a risk control strategy in place first of all, rather than pay for a lazy passive approach to risk control through much higher protection costs.